Magento! It’s not only a word; it’s the first choice of developers for ecommerce development. Initially, Magento was released in March, 2008. Many versions of Magento have been released with improved and new features. All versions of magento always have satisfied the customer’s needs with their easy handling features. The 1st version of Magento 1.0 was released on 24 June, 2008 with API, bundled and virtual products, custom product options. Later in every successor version of Magento 1.0, It got better with new added features. The 2nd version of Magento 2.0.0 was released on 18 November, 2015 with transformation of Magento platform. It had Flexible architecture supporting innovation and fast time to market and enterprise-level scalability and performance. Magento team keeps bringing new features to Magento and makes it better than previous. Now, currently Magento 2.3 is available for download. After a long wait, Magento 2.3 is expected to be a major release for the 2019 omnichannel. So let’s find out, why do you need Magento 2.3 to set up your 2019 e- commerce store? As you can see, Magento 2.3’s concern is already greater than its predecessor. This is mainly due to the new Magento 2.3 functions that are too good to ignore. Today, we'll give you all the advantages and disadvantages of Magento 2.3 so you know why Magento 2.3 is necessary. The Progressive Web App (or PWA) is designed to bring more people to your company, increase conversions and create more leads. It provides a high-performance app-like experience and great usability for web owners. 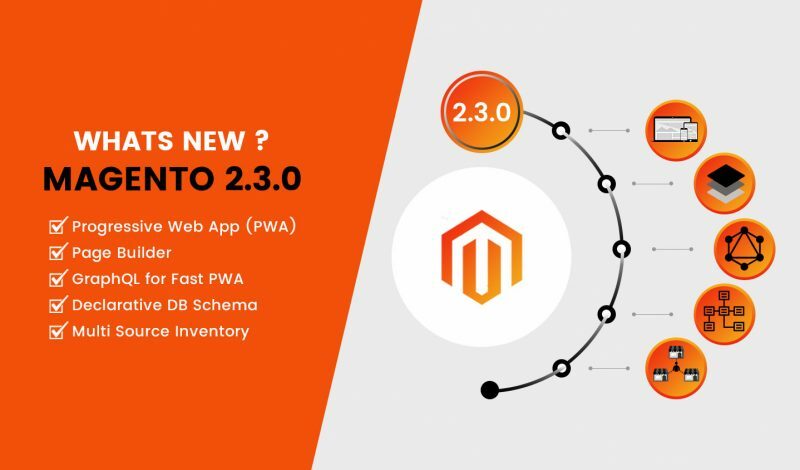 Magento 2.3 is the first version to offer PWA Studio so that it can easily be implemented at the front end of the website. In order to make PWA work, you also need the GraphQL Language feature in Magento 2.3. PWA is thought to be ecommerce’s future. This is because they can bring a number of advantages to your business that you have never seen before. Not a big update from Magento 2.3, but the Asynchronous and Bulk Web API functionality in Magento 2.3 is important to accelerate your daily tasks. Magento 2.3's Asynchronous API works over message queue (now both in Magento Open Source and Magento Commerce) to perform Web API asynchronously and complete background tasks. As a result, you can easily process batch processing. Magento 2.3 also features Magento Open Source Updates for Elasticsearch. This gives merchants the opportunity to integrate a powerful search capability, including faceted search– filtering by attributes, into their stores. Last but not least, the page building function should only be mentioned in Magento 2.3. The Page Builder function allows traders to create custom pages without writing a code. This is a big update because the current Magento page builder is an uncoded nightmare. The simple drag-and-drop function definitely reduces the time required to create a new page. With PHP 7.2 supports, Magento 2.3 will not only offer new development features, but will also improve performance and safety. Argon2 is a powerful hashing algorithm that won the 2015 Password Hashing Competition and PHP 7.2 brings it to us as a secure alternative to the Bcrypt algorithm. Magento 2.3 also features Google reCAPTCHA and Two Factor Authentication to add more protection layers to your Magento admin panel against malicious attempts. This is Magento 2.3's golden feature. MSI enables merchants to manage all inventory sources without extensions or platforms from third parties. This feature allows stock management in several locations so that traders can correctly reflect their physical warehouses in the Magento 2.3 system. Using MSI, you can remove any inventory extensions on the market. Of course, you will be asked to purchase an extension of inventory management, but if you do not have the budget, you can still manage your stock with MSI. Every big update of Magento results in a mass update of the Magento extensions from third parties. Magento 2.3 has just been released, and many Magento extension providers do not seem to be adapting to this upgrade. So if you have many Magento extensions and you want to jump to Magento 2.3, please ask for support before doing so. It is very intimidating for beginners to upgrade to Magento 2.3. Since there are so many new features in Magento 2.3, a lot more composer packages will be introduced. You will need more time to install all these packages (GraphQL, PWA Studion, MSI…) than a normal update. It may also lead to version conflict and unexpected setup tasks. In addition, thanks to the declarative schemes in Magento 2.3, since this is a new schema approach with only Magento 2.3, you cannot easily roll back to the previous Magento 2.2. You don’t need to worry to look back in the past of Magento versions. So what do you think? Looking for upgrade to Magento 2.3 or ecommerce development services? If yes, don’t hesitate and waste time, contact us today for Magento web development services.